Arrow turns up the tensions between the two teams when they come to blows over their differing views on what to do with Evil Laurel. The binary team dynamic has been a mixed bag since it was introduced but it has a lot of potential as it has built in dramatic possibilities. In every episode since the teams separated there has been some excuse for them coming together so this is the first episode where they are actually working on their own with separate agendas. Dinah is still obsessed with avenging Vince’s death by getting her hands on Laurel so her entire team’s resources are devoted to finding her and bringing her down. Curtis and Rene support her but aren’t overly comfortable with her intentions so there is some internal conflict within the team itself. It is mentioned that she is behaving as Oliver once did with a single minded attitude that couldn’t be reasoned with and it’s the best comparison that could be made. Dinah is a lot like Oliver was in season 1 with the notable difference of being in a team where decision making is unanimous which allows an opportunity for Dinah to be reasoned with. On the whole Curtis is that voice of reason as he is committed to bringing Evil Laurel to justice but doesn’t see her death as being acceptable so spends a great deal of time trying to convince her to take a less murderous path. It’s a difficult situation because he wants to be supportive of her as a member of the same team but doesn’t feel comfortable with her intentions so he’s hoping that her better nature will eventually win out. Much of the tension between the two teams is awkwardly manufactured. Team Arrow aren’t exactly at their best when they barge into the other team’s HQ hurling accusations about keeping Evil Laurel prisoner. This conclusion is reached after investigating the alleyway where Evil Laurel was last seen and finding Dinah’s footprint in a very suspicious place leading them to conclude that the other team are holding her hostage. It’s an entirely circumstantial assumption made even more ridiculous by allowing the audience to see a similar investigation conducted by the other team earlier in the episode. Omitting that would have made the situation more ambiguous assuming we hadn’t already seen Quentin bundle Laurel into his car in the previous episode. This means that the episode squanders two potential reveals making the team conflict seem even more ridiculous since the audience are given no opportunity to come to their own conclusions. The writers are clearly trying to create their own version of Captain America: Civil War by lining up a scenario that forces the two teams to come to blows. This means that they have to differ on a singular issue and ideally their points of view have to make sense. In fairness they do to a certain degree but it’s incredibly forced in the execution. 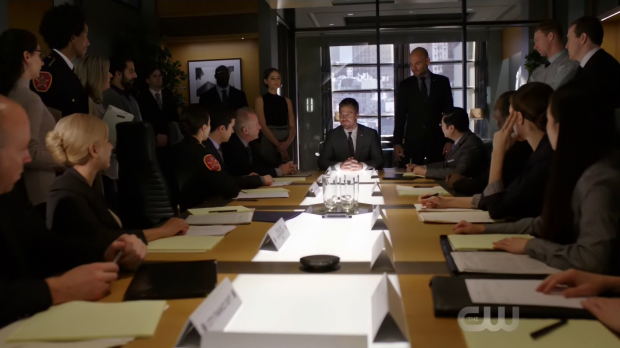 Dinah’s vengeful attitude means that she behaves very out of character based on what we’ve seen before which is its own form of manufactured conflict and the original Team Arrow are only interested in Evil Laurel because they believe she has the money that Cayden James extorted from the city. A significant issue is that it makes no sense for Evil Laurel to have that money because the timeline really doesn’t add up. Did she take a trip to Corto Maltese when Cayden James was planning to blow up the city? There’s no way she could have since everyone was taking it upon themselves to get out of the city because they didn’t trust James to be forthcoming with his escape plan. It makes even less sense when you consider that Team Arrow have been dealing with a mysterious -to them- figure who causes issues for them using doctored photographs and videos so the fact that this wasn’t even considered when the video of Evil Laurel withdrawing the money from the bank in Corto Maltese is baffling. Certainly Felicity should have spent some time at least trying to track Evil Laurel’s movements following withdrawal of the money. The plotting is very lazy and clearly only exists to pit the teams against one another. If this was all part of Ricardo Diaz’ plan then it would at least be something but the execution suggests ineptitude on both sides to make them fight. The most striking scene was when Oliver, Diggle and Felicity entered the other team’s bunker to hurl accusations. They have no right to do this and don’t conduct themselves very well. Felicity admits to hacking them which Curtis takes exception to for good reason. Team Arrow take the approach of mistrust rather than establishing all of the facts. It’s a good scene because it shows how high tensions are between the two teams though it seems inconsistent with Oliver’s more measured approach of late. The whole idea is that Oliver is desperate because the city is mere days away from bankruptcy so doesn’t have time for niceties but he should at least consider what he knows about those he used to lead. I wonder how much could have been saved if someone had simply contacted Curtis to ask why Dinah’s footprint was found at the scene. It would have provided a straight answer and delayed the breakdown in that relationship between the two groups. Despite how manufactured the narrative is there is an opportunity for some strong acting. Rene is particularly compelling as he gets right in Oliver’s face about his desire to fight even if he claims he doesn’t want to. This is proven when he shoves Oliver -for a clever reason- and he retaliates just as expected. Once again if you assume that Oliver is desperate and not thinking clearly then his behaviour makes some kind of sense though it doesn’t stand up under scrutiny. 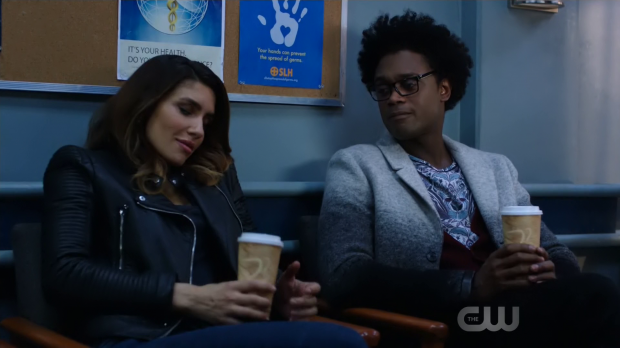 The weak link is Juliana Harkavy who plays Dinah’s anger and grief as being completely over the top. The situation escalates to a physical confrontation at the end of the episode. Team Arrow agree to help Evil Laurel leave the country in exchange for the money being returned despite having no reason to believe that she will do what she says. Nothing about Evil Laurel’s behaviour suggests she’s in any way trustworthy though the desperation angle suggests that there is no other choice at this point. Again, it doesn’t quite work though it does get the two teams on opposite sides of the issue. One thing that does work is establishing defined consequences to the conflict. Before the two teams come to blows there’s a long discussion between Oliver and Diggle where the implications of them fighting is discussed. Both men are aware that fighting for Evil Laurel is a line that may not be possible to come back from. Defending Evil Laurel means that they are siding with her over the old team and the breakdown in the relationship might be irreparable. As always Diggle will support Oliver’s decision but wants to ensure that he’s aware of the full scope of the consequences. Of course he is but once again desperation leaves him with little choice. Interestingly there’s a lot of discussion about how difficult a situation this is. The question is asked whether there would be any issue if the people coming after Evil Laurel weren’t their former teammates. There isn’t an easy answer to that because the counter argument is asking whether as much effort would be made to protect Evil Laurel if she didn’t remind them so much of the Laurel they lost. Once again there is no easy answer but it’s a good open question to consider even if it does seem to be the entirety of Dinah’s argument. One thing that isn’t considered is whether her desire for vengeance would be tolerated no matter who it was. If she wanted to go after Ricardo Diaz when he was needed to return the money to the city then the same issue would exist. Both teams are applying extra weight to the situation because she looks like Laurel and it’s difficult not to due to the personal connection her face represents. The fight itself is less than coherent to watch though there was a lot of weight behind the conflict which helped. There was no attempt to pretend that the new team are a physical match for Oliver in any way and I got the strong impression that Oliver was holding back somewhat. 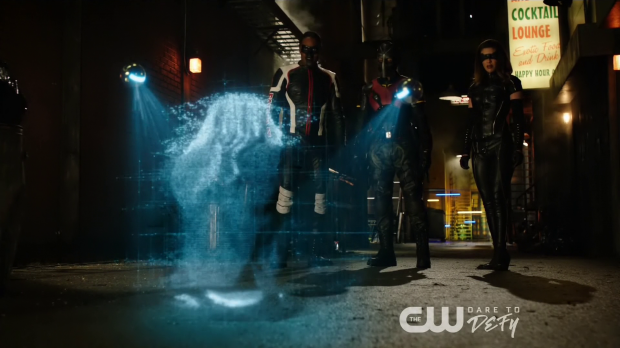 The theme of crossing a line was strongly handled when Curtis used Diggle’s chip as a means of homing in on them which causes Diggle a lot of pain. It’s not a decision that Curtis makes lightly but his willingness to do it is something that Felicity in particular finds disgusting. 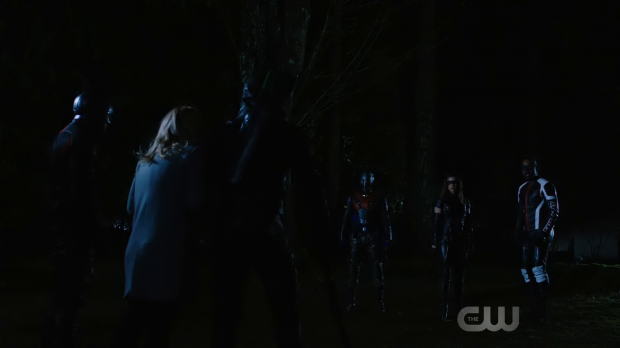 Her violent reaction is a little over the top but well played by Emily Bett Rickards to make it clear that the other team have gone too far. Oliver ends up reopening Rene’s gunshot wound landing him in the hospital with serious injuries which fully solidifies the divide between the two teams. Diggle and Felicity showing up to the hospital only to be told they have no right to ask about Rene’s well being is cold and cutting along with Curtis making it clear that there will no longer be any cooperation between the two teams because they have simply gone too far and created an unforgivable situation. The moment has real dramatic heft and it sets up a situation that is difficult to come back from. I’m reminded of the situation in Angel where the team lost trust in Angel himself and applying that to Wesley at a later point. In that show the team were brought back together gradually and organically with a great deal of complexity attached to the way those relationships broke down. This isn’t nearly as good but it’s compelling enough to make me wonder if there is a way back from it. I suspect that they will work together to bring down Ricardo Diaz at some point but hopefully some animosity will be kept between them in order to make this feel more real. It’s unclear what this means for Felicity and Curtis’ business venture but I’m sure that question will be answered. Dinah’s desire for revenge pays off when she is given the opportunity to deal a killing blow and chooses not to. This is after some prompting from Curtis who points out that she’s better than this and it won’t bring her peace. It’s the usual “don’t kill” speech but Echo Kellum delivers the dialogue with a great deal of sincerity and it doesn’t really solve anything whether Dinah kills Evil Laurel or not. There’s the usual warning attached to seeing her again from both sides and neither team walks away from this having the moral high ground. It’s interesting to have two teams who fail to live up to their best selves. Quentin’s handling of the Laurel situation is somewhat problematic in that what he says doesn’t seem to match up with his actions. I mentioned in my review of the previous episode that his fixation on turning Evil Laurel into his daughter is bordering on creepy and this continues here. His assumption that she is constantly on the lookout for a father figure is concerning though at least that is thrown back in his face. Evil Laurel constantly insists that there is nothing about her to be changed even if she hesitated when killing Vince. As far as she’s concerned Quentin is grasping at straws with that one and all she wants to do is disappear before Dinah catches up with her. Of course Quentin’s intentions are honourable to a degree as he wants to give Evil Laurel the opportunity to make a decision about how to move on with her own life no matter what that may be. The fact that he’s willing to go on the run with her is a bit of a stretch and his obsession with her isn’t addressed by the other characters in a way that makes sense. Oliver should at least give him something of a hard time about his actions. Thea is about the most sensible character in all of this as she tows the line between supporting him yet trying to point out how misguided he is. This makes good use of their strong relationship and highlights that the situation isn’t a simple one. Evil Laurel pretending to be the other Laurel back from the dead should complicate things further. A solid if problematic episode that manufactures a conflict between the two teams that doesn’t entirely make sense. If Oliver’s desperation is used as the reasoning for his behaviour then it sort of works though there’s no real excuse for Team Arrow to burst into the other team’s HQ and hurl accusations. Especially when the reasons for doing this in the first place are horribly contrived. This is something that is addressed and the situation becomes more complicated when both teams cross the line in different ways. The complexity of a woman who looks like Laurel being involved is addressed but not answered as is the attitude of dealing with treating the other team like an enemy. By the end of the episode things are done and said that appear to tear the relationship apart completely which leaves them in an interesting place. The fight itself is visually confusing though there are a lot of strong aspects of it such as the other team being no match for Oliver and Dinah making a decision to be the better person and not exact revenge by murder. Quentin’s relationship with Laurel continues to be problematic though at least this is addressed by Thea who both supports him and points out where he’s going wrong. His assumption that she is simply looking for a father figure is awkwardly misguided but it’s appreciated that the writers aren’t taking the easy way out and beginning a redemption arc for Evil Laurel in a predictable way.